Prevent foreign attackers to open a session. Prohibit users to connect at night. Provide highly secured user’s environment. RDS-Knight Security Essentials is the essential security package that focuses on keeping remote connections in a safe place for all users with three fundamental protective measures. It is the efficient “turn-key” security solution that every RDS Administrator needs. 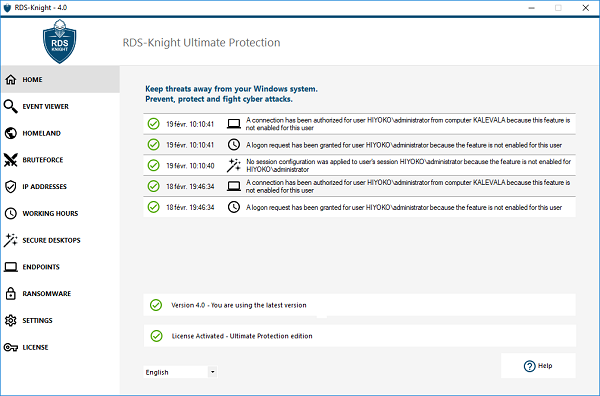 RDS-Knight Ultimate Protection is based on the Essentials Edition: it provides three additional protective features intending to lock down RDS Servers and protect them against any breach that could lead an organization to a failure. Each of these measures can be applied differently per user and per group. It is the essential shield for securing large environments, running on Servers with multiple connections.